One of our core values has always been to improve the health of the community as well as the health of our members. We demonstrate our commitment through a variety of programs and activities. In addition to their work in our Atlanta-area medical offices, many TSPMG clinicians devote significant time to volunteer work in Atlanta and around the world. We also provide care through several “safety net” clinics that offer a wide range of services, from primary care to ongoing treatment of chronic diseases. Our program, known as TSPMG Cares, improves the ability of safety net clinics to care for those most at risk in our communities. Currently, TSPMG Cares clinicians care for patients in the Hands of Hope Clinic in Stockbridge and the DeKalb County Board of Health Refugee Center in Decatur. Each week, our volunteer practitioners spend a half or full day delivering primary care and treating a broad range of chronic health problems. 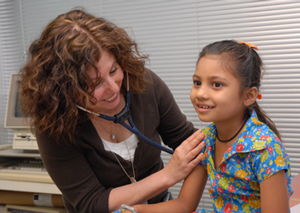 Kaiser Permanente’s Community Benefit program helps fund the program.